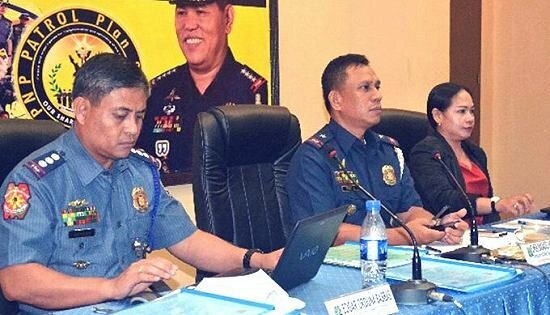 Police Chief Superintendent Elmer R. Soria (center) presiding the PRO8 Command Conference on Friday morning. At left is Police Senior Superintendent Edgar O. Basbas, Acting Deputy Regional Director for Administration and Atty. Maria Corazon S. Montallana of the Comelec (right). CAMP SEC. RUPERTO K. KANGLEON, Palo, Leyte – The Police Regional Office 8 (PRO8) will establish more police checkpoints as part of the implementation of the election gun ban beginning Sunday, January 13, even as it reminded its personnel to observe standard operating procedures in carrying out checkpoint operations. “We will set-up more checkpoints in strategic places to strictly impose the gun ban during the election period,” said Police Chief Superintendent Elmer Ragadio Soria, PRO8 Regional Director as he ordered his men during Friday’s command conference attended by members of Directorial Staff, City and Provincial police directors, chiefs of National Support Units and officials from the Commission on Elections (Comelec). Soria added that this forms part of PRO8’s efforts to reduce election-related violence in the midterm polls, the intensified crackdown against loose firearms and in compliance to Comelec Resolution 9561-A which states that bearing, carrying and transporting firearms and other deadly weapons outside the residence or place of business and in public places are prohibited unless authorized in writing by the Comelec. “We are in close coordination with the Comelec and our counterparts in the Armed Forces of the Philippines on this matter,” he informed. “With the gun ban, all permits to carry firearms outside residence issued by the PNP to civilian gun holders are suspended except for regular members of the PNP and AFP on duty and in full uniform and members of government agencies who are actually performing law enforcement and/or security functions,” Soria further disclosed. The Comelec resolution also exempts members of privately-owned or operated security, investigative, protective or intelligence agencies subject to some provisions, Justices of the Supreme Court, Court of Appeals, Sandiganbayan, Court of Tax Appeals and judges of regional, municipal/metropolitan/circuit trial courts and security personnel of accredited foreign diplomatic corps and establishments under international law. Soria further reminded police officers manning checkpoints to observe standard operating procedures including being in full uniform and in well-lit areas with proper signage at hand. The procedure also indicates that the policemen are limited to conducting visual checks of the vehicles they are inspecting. “You are reminded to be polite as you approach the motorists, such gesture will earn their trust and respect,” the regional director told his men. He also encouraged the public to be vigilant against abuses at the checkpoints and report erring policemen by reporting the matter to the nearest police station. 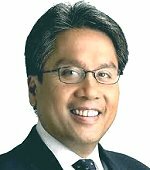 TACLOBAN CITY – Secretary Mar Roxas of the Department of the Interior and Local Government (DILG) will lead the signing of a covenant on April 13, 2013 for peaceful elections in the province of Samar. This was revealed by Regional Director Pedro A. Noval Jr. of DILG, who added that this pact among rival politicians, initiated by the Commission on Elections and Philippine National Police among others, would be held at the Calbayog City cathedral and be blessed by no less than Most Rev. Isabelo C. Abarquez, Bishop, Diocese of Calbayog. Candidates for governor, sangguniang panlalawigan, congress, mayor, city and municipal sanggunians in Samar are expected to join the pledge aimed at ensuring honest, orderly and peaceful elections on May 13, 2013. “This comes after Samar province was identified as one of the areas of concerns in the upcoming elections due to its history of heated electoral contests,” said Dir. Noval. Upon arrival from Manila at about 9:00 in the morning, Secretary Roxas will meet with regional and provincial officials of DILG and its attached agencies before attending a forum with civil society groups. The covenant signing on the other hand will begin with a mass to be held at 10:00 AM. Samar elections supervisor Atty. Ma. Corazon Montallana will open the activity with some welcome remarks, followed by the Message of Secretary Roxas. Pledges of Commitment will then be given by Comelec RD Jose Nick A. Mendros, RD Elmer R. Soria of the Philippine National Police, MajGen. Gerardo T. Layug, Commanding General of the 8th ID. After the blessing of the signed document, candidates will symbolize their intent to contribute to peaceful elections by releasing doves into the skies. Acting as master of ceremonies will be Atty. Fidel C. Amazona, City Election Officer of Catbalogan. Organizers hope that with their public gesture of signing the agreement, as well as with the vigilance of media, civil society and of voters, candidates would match their words with actions to pursue peaceful and credible elections in the province. 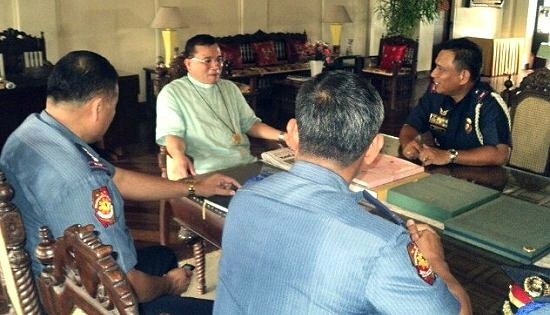 PCSupt Elmer R Soria, PRO8 Regional Director (right) conversing with Bishop Isabelo C. Abarquez (center) at the Bishop’s House in Calbayog City during the planning stage last December 8, 2012 for the elections peace covenant signing slated on January 13, 2013. CAMP RUPERTO K. KANGLEON, Palo, Leyte – Department of Interior and Local Government (DILG) Secretary Mar Roxas will witness the signing of peace covenant among the police, church leaders and local candidates in Samar, aimed to ensure a peaceful conduct of 2013 elections in said province. “The presence of the good secretary is an indication that the government is serious in ensuring a secured and fair elections especially in “priority areas,” said Police Chief Superintendent Elmer Ragadio Soria, Regional Director of Police Regional Office 8 (PRO8). The PRO8-initiated signing of peace covenant is scheduled on January 13 at the Saints Peter and Paul Cathedral in Calbayog City with supports from the Diocese of Calbayog and other stakeholders like the DILG, Commission on Elections and counterparts in the Armed Forces of the Philippines. “This activity is an ideal way to encourage the candidates to commit themselves to support a peaceful and orderly elections. The beauty of democracy shines brightly with upright leaders, enlightened citizenry and vigilant community,” Soria added. Most Rev. Bishop Isabelo Abarquez will officiate a pontifical mass followed by the signing proper of the manifesto and blessing of peace covenant. Aside from Sec. Roxas, COMELEC Regional Director Jose Nick Mendros, Major General Gerardo T Layug of the Army’s 8th Infantry Division and other stakeholders will also attend the occasion while local candidates running for elective posts in the province and in the cities of Catbalogan and Calbayog have also confirmed their attendance in the activity. Samar, with a voting population of 481,275 in its two cities and 24 municipalities, was listed in the DILG list of “priority areas” owing to its history of poll-related violent incidents and presence of private armed groups and New People’s Army in the area. To ensure a peaceful conduct of the May 10, 2013 elections, Soria activated the Regional Special Operations Task Group (RSOTG) to go after the remaining 2 PAGS operating in the province and intensify the campaign against loose firearms. “This is in line with the SAFE 2013 program of the PNP to ensure a ‘Secured and Fair Elections’ not only in Samar but the entire Eastern Visayas region,” Soria informed. TACLOBAN CITY – Even as the victims of typhoon Pablo continue to struggle to make their lives as normal as possible, kind-hearted brethren from the various parts of the country continue to give their share in easing the burden of the victims. In the spirit of solidarity and brotherhood, the employees of the Department of Agrarian Reform (DAR) in Eastern Visayas forego with a lavish Christmas party in 2012 in to donate to the victims of typhoon “Pablo” in Mindanao. DAR-8 Regional Director Eliasem Castillo disclosed that the entire DAR organization in Region-8 was able to raise a total of P60,640 from the staff of the Regional and six provincial offices for the victims in the typhoon-ravaged areas. “We are so blessed here, it is just right for us to share those blessings especially to the needy this Christmas, which is a season of sharing,” Director Castillo said. Meanwhile, Mr. Jose Alsmith Soria, DAR-8 Regional Information Officer, said that in the tradition of Christmas celebration, the DAR employees still had their simple but memorable Christmas Party on December 21. Mr. Soria, intimated that earlier, the management of DAR planned to hold the Christmas party in a venue outside of the office but decided at the last minute to hold it instead at the agency’s training center to save much and donate the money for the typhoon Pablo victims in Mindanao. In response to the example set by President Benigno S. Aquino III, many government agencies in the Region decided to hold the simplest if not forgo entirely their Christmas Parties and instead donate the fund for the victims of tropical storm Pablo in Mindanao. Among these agencies are the Philippine National Police, the 8th Infantry Division of the Armed Forces of the Philippines, Pag-Ibig Fund, Department of Social Welfare and Development, the Office of Civil Defense and the Philippine Information Agency. CEBU CITY – With the start of 2013, many predictions arise on what will happen this year in politics, governance, global economy, and the state of our nation. “2013 would be a very prosperous year as far as Cebu is concerned. This is because of the economic development and movements spurting our economy,” Roderic "Ricky" Poca, political analyst and media man, said during the Jan. 5 episode of “Pagtuki”, the official radio program of Ramon Aboitiz Foundation Inc. (RAFI). He also added that the existence of the business process outsourcing (BPO) sector contributes to the booming economy of the country. He said that the May elections is expected to have positive and negative impacts to the economy as well. For economist Fernando "Perry" Fajardo, the economy of the Philippines is in smooth sail. In fact, he said that even though there is global economic crisis, the country’s economy is flourishing. “Before, we are so left behind by our neighboring Asian countries like Taiwan, Hongkong, Singapore, and Malaysia. But now, due to improved governance, we were able to regain the trust of our investors,” Fajardo said. “We have a 6.4 percent growth rate in the year 201, higher than what we targeted. I also see that in this year, it will be the same or, perhaps, higher because of the upcoming elections,” he added, pointing out that elections enable government to create more projects for the people. He pointed out, though, that the challenge for this year is how to address the unemployment rate of the country. He said that micro-enterprises can help reduce unemployment. As much as the country wants to be economically stable, Dr. Jocelyn Gerra, executive director of RAFI Culture & Heritage, stressed that it is also important to continue the cultural awareness among the public. “I hope that the programs and campaigns of both private and public sectors would engage more people to think about our culture and heritage and to appreciate our identity, history, and values,” she added. She said that she can now see a higher number of people aware and educated about their culture. She cited Gabii sa Kabilin, an initiative of RAFI held every May, as an event that has been looked forward to by the public, especially the youth. “The local government units (LGUs) are doing their best to educate people on local history. We cannot do it alone, we need partners to help us carry out these activities,” she said. She said that many people are now visiting local museums and heritage sites. "Pagtuki” is aired over dyLA every Saturday at 10-11 a.m. The program, which is one of the Knowledge Sharing & Advocacy capabilities of RAFI, tackles timely and relevant issues affecting the Cebuano community. CEBU CITY – To promote social advocacies through digital media, Cebu Bloggers Society (CBS) organized the first World Blogathon last Dec. 8, 2012 at Andy Hotel in Mandaue City. The Ramon Aboitiz Foundation Inc. (RAFI) was one of the participating organizations that attended the offline event. Other groups were Island Rescue Organization (IRO), AIESEC, MIND7, Love Yourself, World Vision, and “Dok Buboy”. Representatives from each organization introduced their respective advocacies. Nancy Cudis, RAFI's communication specialist for media and public relations, presented the Foundation's different focus areas and programs, including Mega Cebu Project, where RAFI is the Research, Program, and Organizational Development (RPOD) unit of the Metro Cebu Development Coordinating Board (MCDCB) for the said project. Mega Cebu Project is a 30-year master plan program and framework for a long term and collaborative planning and action towards a more sustainable city-region. IRO, an animal welfare organization, calls for responsible pet ownership. AISEC, an organization that develops youth through integrated learning experience. National Nutrition and Development 7, together with Kapisanan ng Brodkaster ng Pilipinas-Cebu Chapter and group of media practitioners, battle malnutrition through nutrition advocacy and promotion. Love Yourself is a non-government organization that promotes awareness, prevention, education, and counseling on STI and HIV. A heightened human trafficking awareness and prevention is the mission of the International Justice Mission (IJM). The World Vision is a community-based, Christian organization that works with children, families, and communities to overcome poverty and injustice. “Dok Buboy”, the last speaker, is a microbiologist, blogger, media online auditor and a CBS member. Through his blogs, he has promoted his city and his advocacies for public health and social change. Ruben Licera, president of the Cebu Bloggers Society announced that the World Blogathon will be held every quarter of the year and encouraged Cebu bloggers to blog about events and organizations that matters. Jaysee John Pingkian, CBS Outreach Committee head, said that CBS will focus more on social responsibility on its third year. He added that CBS will hold on March of this year a National Social Summit that will tap the youth, business sector, and non-government organizations. QUEZON CITY – Rights groups and advocates, led by Karapatan and Bagong Alyansang Makabayan (BAYAN) met with protest the first meeting of Noynoy Aquino's "high-level inter-agency superbody" against extrajudicial killings and other rights abuses. "The victims and their loved ones have had enough of these extraneous superbodies that are mere publicity schemes but does not solve human rights violations," said Karapatan secretary general Cristina Palabay, "What's worse is that this body may even attempt to conceal the continuing atrocities, especially in the rural areas." Karapatan pointed out that the "superbody," like other inter-agency task forces under the Arroyo government, is inessential in solving cases of extrajudicial killing (EJK) and other human rights violations. As of November 30, 2012, the rights group has documented a total of 132 victims of EJK and 12 victims of enforced disappearance under the Noynoy Aquino government. Palabay added that the body will not deter rights violations perpetrated by state security agents, especially by the Armed Forces of the Philippines, as long as the Aquino government's counter-insurgency program Oplan Bayanihan is still being implemented. "The wave of illegal arrests and detention of a total of 29 civilians, all accused as members of New People's Army, in December 2012 and January this year, is a reason for alarm," Palabay said. "We believe that incidents of illegal arrest, extrajudicial killing and other rights violations against innocent civilians and activists will escalate as the mid-term elections draws near. The Aquino government and the military are likewise hell-bent in reaching the 2013 deadline set under Oplan Bayanihan, the counter-insurgency program that victimizes civilians,” explained Palabay. “If this government is truly sincere in rendering justice for the victims of rights violations, the mandated agencies and the courts should do what they should be doing – properly and effectively investigate these incidents, and to jail and prosecute the violators,” Palabay concluded. 1. Union organizers and staff of Confederation for Unity, Recognition and Advancement of Government Employees (COURAGE) Randy Vegas and Raul Camposano. The two, who were arrested on December 3, are implicated in the ambush of soldiers by the NPA in April 29, 2012. This fabricated charges filed in Labo, Camarines Norte, also implicates Bayan-NCR leaders Roy Velez and Amelita Gamara. 2. Lay church worker Anecita Rojo, 48, was arrested and forcibly dragged from the Parish convent in Bago City, Negros Occidental by members of PNP Regional Intelligence Unit on December 7. She was brought to Bago City Police Station where she was shown a warrant of arrest for murder charges issued by Branch 60 Cadiz City Regional Trial Court. Rojo was later brough to Cadiz City. During the two-hour trip to Cadiz, the police interrogated Rojo about her daughter, as well as her son-in-law Christian Tuayon. Tuayon is the Secretary General of Bayan-Negros who was arrested, and was later released on bail, on April 2012 for robbery-in-band charges, also filed at Branch 60 Cadiz City RTC. Both Rojo and Tuayon are implicated in alleged NPA ambuscades (or activities?) in Negros. Rojo remains in detention at Cadiz City-BJMP. 3. In Isabela, Negros Occidental, nineteen, including three minors, of the Tribu Bukidnon indigenous people were illegally arrested on December 13. Members of the 11th Infantry Battalion of the Phil. Army barged in their village and accused the farmers of keeping NPA members. The farmers were threatened and hauled off to the Isabela police station. Eleven of them were released on December 15, while 8 farmers were charges with murder and multiple frustrated muder, and are currently detained at the La Carlota-BJMP jail. One of the victims is now showing psychological trauma due to alleged (beatings by the police). 4. In Mulanay, Quezon, farmers Dennis Ortiz, Eleceo Lopez and a 17-year-old boy,were arrested on December 21, while travelling by habal-habal. The three are accused as NPA members and charged with violation of Republic Act 8294, and are currently detained at the Quezon Provincial Jail. Also arrested were the drivers of the habal-habal, Alex Gerez and Ariel Bordahe who were released the following day. 5. On Christmas day, Oligario Sebas, 65, was arrested in Negros Oriental by joint AFP and PNP members. The arresting team insisted that Sebas is "Felimon Mendrez," supposedly a top-ranking NPA cadre in Central Visayas, who is charged for rebellion. The soldiers and police also barged into, and illegally searched his house. Despite his denials that he is Mendrez, the ailing and diabetic Sebas was brough to Manjuyod Police Station. Sebas is currently detained ay Bayawan City-BJMP. 6. Rene Boy Abiva, a 23-year old employee of the Department of Social Work and Development in Cagayan province and a coordinator of the ACT Teachers Partylist, was arrested on December 28 for charges of murder. He was arrested by units led by a certain Col. Julius Balana of the Regional Intelligence Division of the PNP and is currently detained at the Sto. Domingo PNP station at Tuguegarao City. Upon inquiry of his wife on the supposed charges against him, his arresting officers said that he is being arrested for his supposed involvement in the April 2012 NPA ambush of at least 12 soldiers under the 86th Infantry Battalion of the Phil. Army. The said unit has been reportedly carrying out rights violations in the course of their military operations in the communities in Tinoc, Ifugao.